Goal of the expedition: At the "Ojos del Salado" in Chile, the highest volcano on earth with an altitude of 6.882m (22,573ft), the expedition team, lead by Rainer Zietlow and Ronald Bormann, transported in the highest possible altitude a seismographic station provided by the "GeoForschungszentrum Potsdam (GFZ)", Geological Research Centre of Potsdam, with a standard Touareg model. The record: The expedition team set a new world record for standard model vehicles by reaching an altitude of 6.081m (19,946sft). 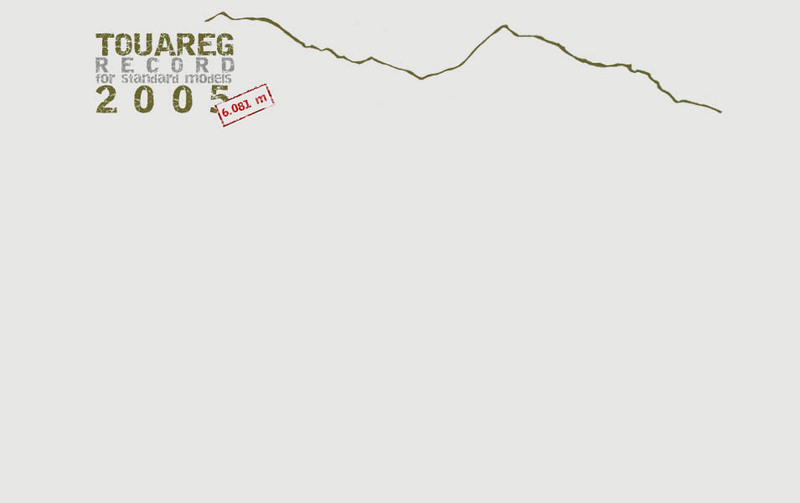 The team: From 15th to 29th of January 2005, eight German men struggled at one of the driest places on earth. In the desert of Atacama, the adventurers ascended the Chilean north face of Ojos del Salado, equipped with oxygen masks. The vehicle: The standard Touareg model "Expedition", produced by Volkswagen Individual, reached the record height without any further modifications. The charitable donation: For each altitude meter done, the expedition team donated 50 Euro Cent to the SOS Children’s Village in Santiago de Chile. ....and after setting the record: On their way back to Wolfsburg Rainer Zietlow and his team are visiting several Volkswagen and other sponsors factories. The team is scheduled to arrive on the 12th of May.